IPY proposals with strong links to Antarctic sea ice are listed below. Full details of each project can be found at the IPY website. Synoptic Antarctic Shelf-Slope Interactions (SASSI). Proposer: Karen Heywood. IPY Project No. 9. Monitoring of Antarctic sea ice thickness by buoys and remote sensing. Proposer: Peter Wadhams. IPY Project No. 52. Sea Ice Mass Balance in Antarctica: Bellingshausen, Amundsen, Ross Seas (SIMBA- BeAR Drift Station). Proposer: Steve Ackley. IPY Project No. 68. A comparative analysis of Antarctic polynyas by modelling and in situ validation (POLYANNA (POLYnya ANalysis in Antarctica)). Proposer: Enrico Zambianci. IPY Project No. 57. An enhanced network of Antarctic Sea Ice Buoys: an optimal deployment for the International Polar Year 2007-2008 developed by the WCRP/SCAR International Programme for Antarctic Buoys (BEARDS (Buoys Encompassing the AntaRctic: an enhanced Deployment Strategy)). Proposer: Enrico Zambianci. IPY Project No. 108. Role of Antarctica and the Southern Ocean in Past, Present and Future Climate: A strategy for the International Polar Year 2007-2008 (CASO (Climate in Antarctica and the Southern Ocean)). Proposer: Steve Rintoul. IPY Project No. 109. Arctic sea ice. Joint workshop activities will be held to provide comparisons and contrasts with Antarctic sea ice processes and interactions with climate and the ocean in the two polar regions. IPY Project No. 185. 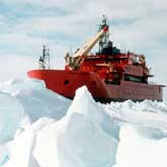 Antarctic fast-ice monitoring to study ocean-ice-atmosphere changes (AFIN (Antarctic Fast-Ice Network)). Proposer: Petra Heil. IPY Project No. 277. Integrated Analyses of Circumpolar Climate Interactions and Ecosystem Dynamics in the Southern Ocean -IPY (ICCED ­IPY). Proposer: Eugene Murphy. IPY Project No. 417. Sea Ice from Space for IPY (SISI). Proposer: Harry Stern. IPY Project No. 921. This page was last modified on August 4, 2011.